Now that was a topsy-turvy match? 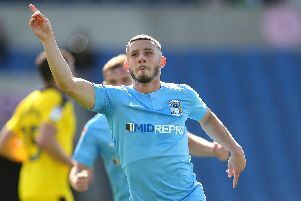 Conor Chaplin did not travel to Doncaster. As mentioned in my preview, my sister’s fiance is a Doncaster fan and afterwards everyone agreed it was honours even after what became a very even game. Pompey were pretty poor in the first half, almost to a man, but in the second half a couple of changes freshened us up and we were the better side. Gareth Evans should have scored from a couple of chances which came his way. Doncaster probably created more in the game, but we created clearer chances. We lost at Doncaster and Bristol Rovers last season, so that’s four more points already. You mentioned that awful first-half display? It was a terrible opening 45 minutes from us, no outfield player had even an average game. Doncaster played very well, pressing us high up the pitch, while our central midfielders couldn’t get hold of the ball and put five passes together. As for Oli Hawkins, he was poor and deserved to be substituted. We were very lucky to go in goalless at half-time – and it improved after the break. Craig MacGillivray is obviously a good keeper, but the first couple of games I saw from him he was no better than Luke McGee. It struck me on Saturday why he had been brought in. He dominated the area, came for catches, spilled nothing, looked in complete control and at no point did he make me feel nervous. He was also the only player who came out of that first half with any credit. What do you make of the Conor Chaplin situation? It is disappointing but might be the right thing if he now goes, he needs regular football elsewhere. I don’t know the ins and outs, but refusing to play is not the best place to be in. It sounds like he is trying to force a move – and it’s best for everyone that now happens. He’s a good young player, but hasn’t justified starting at Pompey recently, unless it’s a 4-4-2.